It's Hybrid Month here at Grandons.. Avail of up to €3500 Scrappage or 3 Years Free Servicing on Hybrid & Conventional Models PCP Rates from 2.9% on Passenger Vehicles and 1.9% on Commercial Vehicles Deals available across the Toyota Range on orders before June 30th. Call in for a Test Drive today! If you want to understand why thousands of drivers have already switched to Toyota Hybrid, our Hybrid Guarantee makes it easy. Buy a 172 Hybrid and if you don’t love it, we’ll swap it for a new petrol or diesel, absolutely FREE. Up to 50% of the time you drive, you’re in electric mode and yet you never have to plug it in. You use up to 40% less fuel and deliver cleaner air for our children’s children. With Hybrid you'll enjoy a quieter, smoother, cleaner drive. To avail of the Toyota Hybrid Guarantee, a test drive for minimum of 24 hours and maximum of 72 hours must be taken before purchasing your new Hybrid. 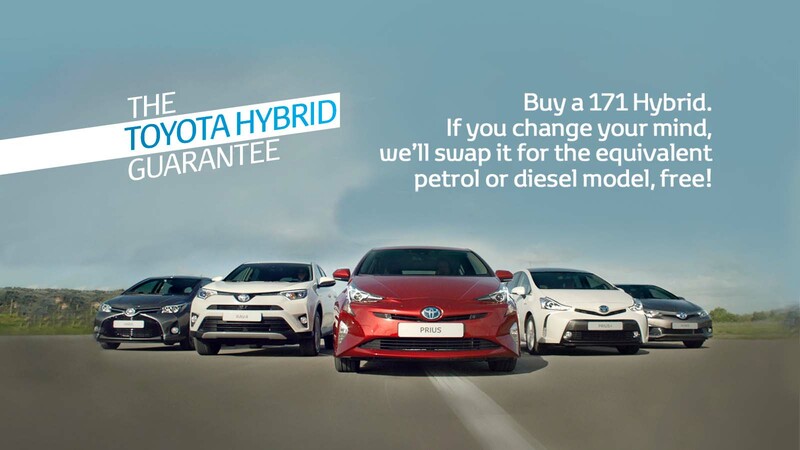 Avail of the Hybrid Guarantee and you'll realise you'll never want to swap your Hybrid back! See how the Hybrid Guarantee can mean no-compromise switching for new Hybrid drivers. To find out more about the Toyota Hybrid Guarantee, visit Grandons this June and see our widest ever range of Hybrids. Toyota hybrid, all told, is the smarter choice. Toyota are in fact the world leaders in hybrid technology. There are more than 10 million hybrid drivers worldwide and, over the last 20 years, thousands of people in Ireland have discovered that hybrids are just...better. We are going show you why Toyota are the leaders when it comes to hybrid, after all we've been producing domestic hybrid vehicles for over 20 years now! The New Prius Plug-In has arrived! Check our our Hybrid Anagram Competition on our Facebook Page!